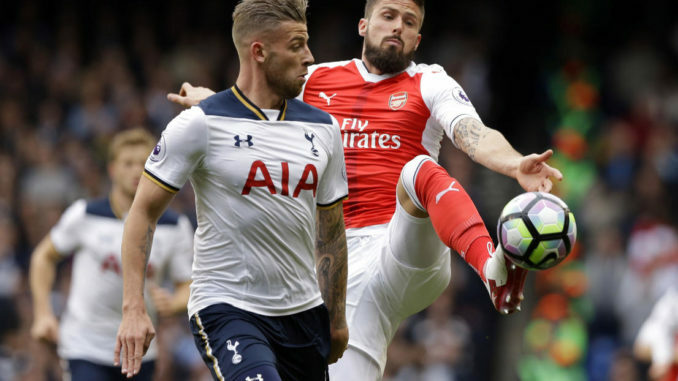 Belgium defender Toby Alderweireld has seemingly played his last game for Tottenham with Manchester United closing in on a deal for the 29-year-old. After three seasons at the club and after having formed arguably the best defensive partnership in the Premier league with fellow Belgian Jan Vertonghen, Alderweireld’s belief that he deserves a bumper pay rise is set to be given to him by a willing Manchester United. The writing has been on the wall for some time and now the Russian summer showpiece event is over and done with, reports coming out of numerous tabloids and trusted sources are that the Red Devils will ramp up their efforts in the next few days to land their target. However, it is not all doom and gloom as Daniel Levy has not been idle, with plenty of warning that Alderweireld would be off sooner rather than later, Levy has been quick to show an interest in a World Cup winning defender as a replacement. VfB Stuttgart’s French defender Benjamin Pavard is the man Spurs reportedly want to replace Alderweireld and it is a transfer that would really excite fans. Pavard is only 22 but has already shown a maturity that would enable him to slot straight into the heart of the Tottenham defence. This summer he shone for a World Cup winning French side and even scored in the Les Bleus epic 4-3 win over Argentina in the round of 16 tie. A product of the Lille youth academy, Pavard rose through the ranks and made his senior debut for Lille in 2014. In 2016, Stuttgart came in for Pavard despite being in the German second division but within a year, Pavard had played an instrumental role in the side winning the title and gaining promotion back to the Bundesliga. Last season, Stuttgart were in the relegation mire until Tayfun Korkut was given the head coach role and after a season playing multiple positions, Korkut fixed Pavard as a center-back. The result was phenomenal as Stuttgart conceded just 10 goals in 15 games to drag Die Roten from relegation trouble to seventh in the table. If all goes to plan, Spurs could be about to pull off yet another defensive masterstroke by signing Pavard. Let’s just hope they get in there before anyone else.